Do you want to remove a duplicated patient? Here’s how to do it. Scenario: You found two or more John Doe in ClearDent and confirmed they are actually the same person. 1. Find the John Doe with the least information. 2. Go to Medical tab. As you can see in the screenshot below, you need to make sure it’s empty and there isn’t any signed medical history. 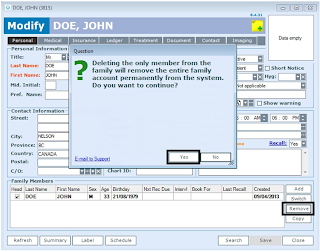 If there are any signed medical history, due to college record keeping requirement, it can no longer removed and you will have to make a sticky note on both the original John Doe and the duplicate John Doe that indicates these two John Doe’s are the same person. 3. Go to Ledger tab and make sure Ledger is also empty. 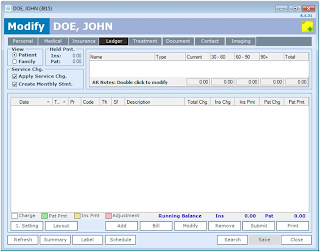 If the ledger is not empty, and you have the security clearance and permission from your dentist to remove items on the ledger, you can first manually re-enter all the ledger items from the duplicate to the original, and then clean up the ledger in the duplicate’s file. NOTE: all ledger item creation and removal are tracked in the audit trail for college record keeping compliance. 4. Go to Treatment tab and again, check to ensure there is nothing in it. If there are, perform the same action as in step 3, ledger. 5. Next, go to the Documents tab. Again, you will also need to make sure that there are nothing in it. NOTE: if there are any signed document or locked documents, ClearDent will not allow you to remove the duplicate per college record keeping guideline. You will have to use the sticky note to cross reference as described in step 2. 6. Now, you need to go to the Contacts tab and remove all items in all three sections. NOTE: all addition/modifications/removal are tracked in the audit trail. 7. 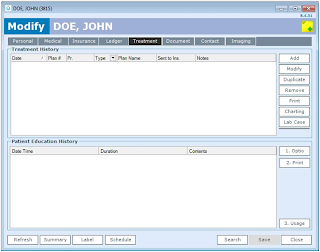 Finally, you have to click on Imaging and remove all the images provided that you have the security clearance in ClearDent and permission from the dentist. 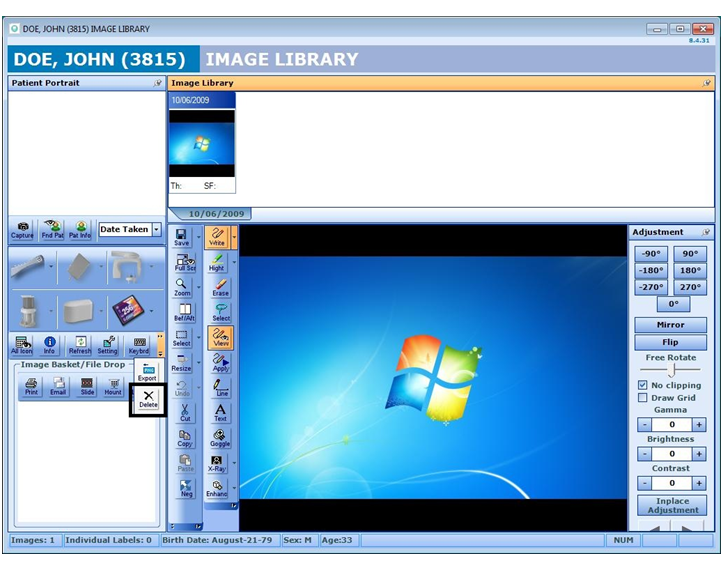 NOTE: all image addition/modification/removal are tracked in the audit trail, and if any images were removed, the original will be kept in a protected archive by ClearDent for college record keeping guideline compliance. 8. 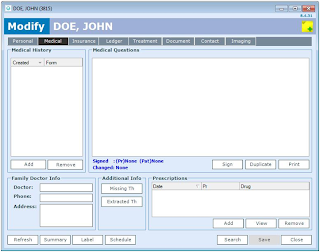 Once you emptied duplicate patient’s Medical tab, Ledger tab, Treatment Tab Documents tab, Contact Tab and Digital Imaging, you are ready to remove the duplicate patient from your database. 9. 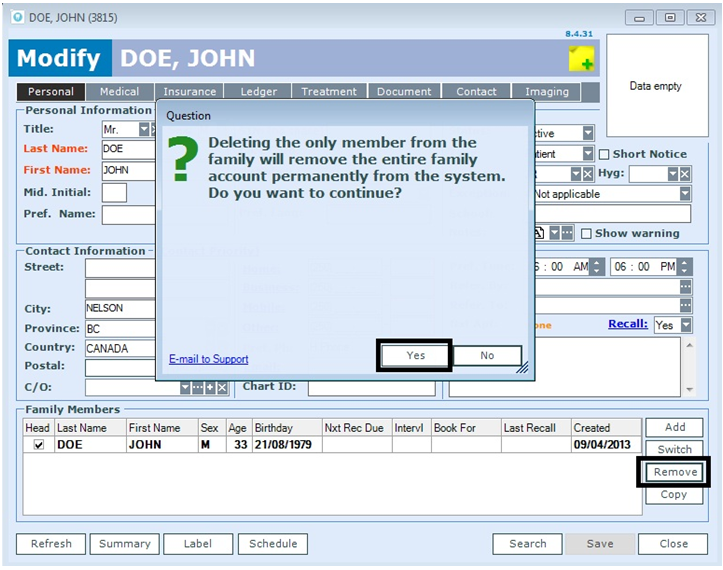 Go to Personal tab, click on Patient, and then click Remove. Once you click Yes, the patient will be deleted from your database. Please make sure to choose a right duplicated patient file and confirm the patient is a duplicate. 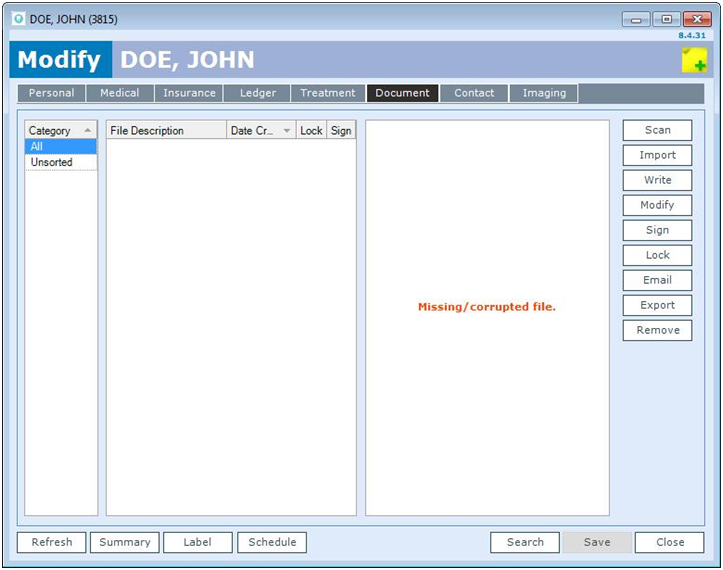 NOTE: deleted patient cannot be systematically restored. 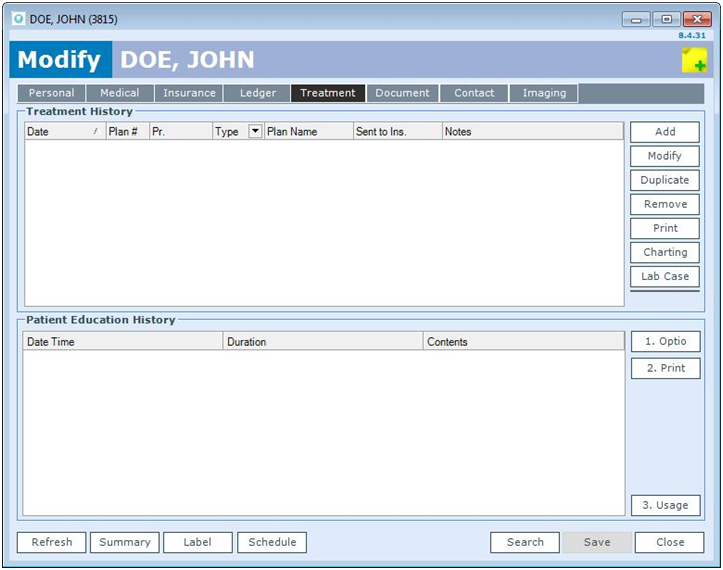 Instead, you will have to access the audit trail or seek assistance from our support to manually recreate the patient file in ClearDent. 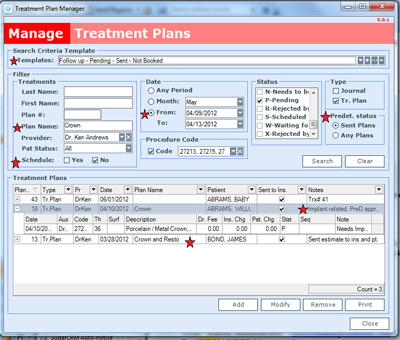 Did you know that every treatment plan you propose is tracked in the Treatment Plan Manager? 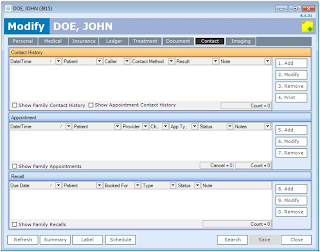 ClearDent helps you to compare potential treatments with actual treatments to pinpoint any productivity bottlenecks in the office. We use tools like Plan Names, Appointment Linking, and Pre-Determination status to effectively identify treatment plans that have stalled and get them back on track. The Treatment Plan Manager should be routinely used as a monitor; we typically suggest checking in on it at least once a week. 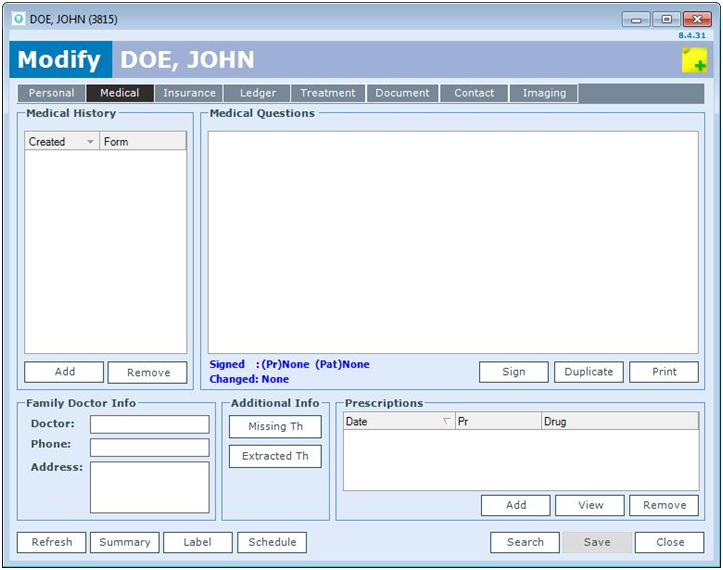 Set up search criteria templates to quickly access outstanding treatment. 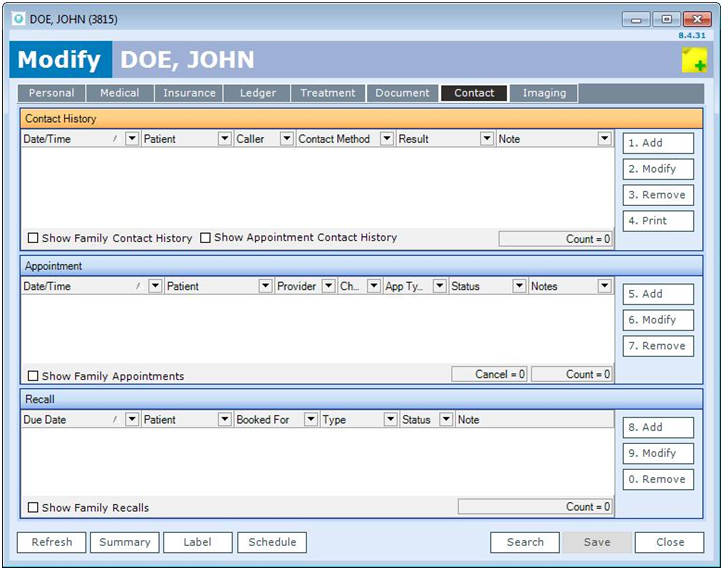 Customize your treatment status to better manage the flow of patients pending treatment. 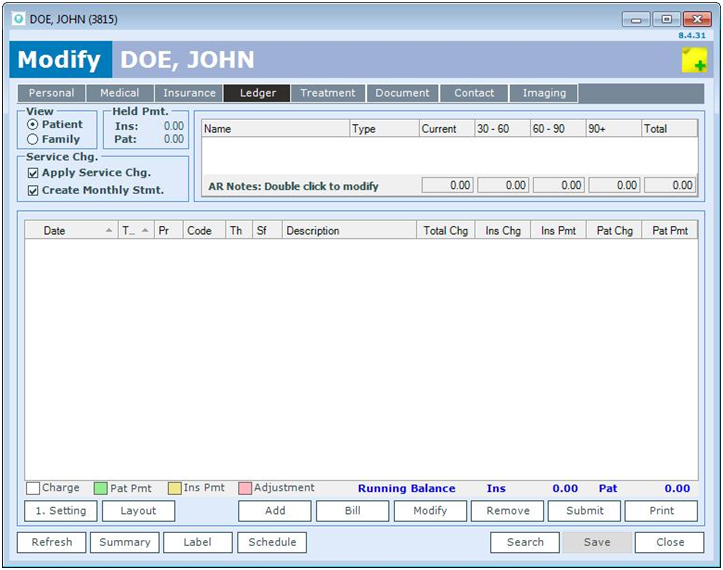 Use information fields such as Intervals, Sequence and Units will help the office properly book your patients into the schedule according to the provider’s recommendations. A common question coming from patients is “Will my insurance cover it?” ClearDent’s Treatment Plan Manager will not only show you plans that are needing to be sent as well as those that have been returned, accepted and are waiting to be booked. Give your patients all the options by creating multiple treatment plans for the same tooth. Track your treatment acceptance so that you can change your approach if need be. 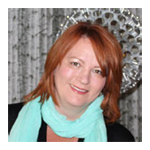 Join Lisa Reynolds, for our Treatment Plan Manager Webinar on Thursday May 9th, 2013! 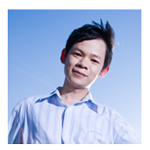 We would like to introduce our new technical support Allan! "I have over 9 years of IT experience and specializes in supporting end users in using computer software and troubleshooting computers and networking problems. I can work independently but I enjoy teamwork even more. I look forward in working together with the ClearDent team, but I look forward even more to work together with you. My key approach is to understand what your needs are and provide a solution that’s not only prompt, but also helps you prevent the same issue from happening again. I hope to make your day-to-day work life easier and more enjoyable – just like how I enjoy my work." ClearDent continues our rapid growth in Toronto and in order to serve you even better, the area will now be handled by senior rep Shelley Shultz. Many of you already know Shelley as she has been working with our Ontario customers for many years. Please contact her with your comments, general questions (support is still your best place to get quick answers for your system! ), and referrals for ClearDent. Shelley is quite knowledgeable about ClearDent and the industry in general. Come see us on Thursday, May 2nd at Joe Badali’s (156 Front Street) for our annual Customer Appreciation party. The fun starts at 5:30pm – we will be serving drinks, some nibbles and don’t forget to enter for your chance to win 2 tickets to the Rolling Stones! These tickets are great seats, and face value is over $1200! We will also be donating $0.30 to AboutFace for every ballot entered. If you can’t make it to the party, and we do hope to see you there, then stop by our booth #1139. At ClearDent we take our customer's comments and feedback very sincerely. Please feel free to let us know how we're doing and how we can better serve you by submitting your feedback form online or by emailing us your comments to support@cleardent.com. 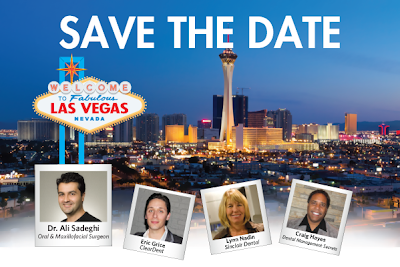 This fall, join Dr. Ali Sadeghi, Eric, Lynn, and Craig in Las Vegas in a one-of-a-kind 16 Credit CE event. 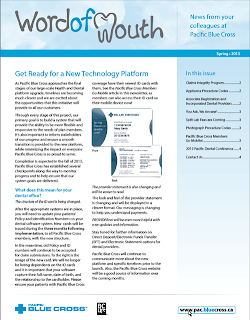 Learn about paperless practice, high-tech dentistry, and pragmatic office management. Keynote speaker Dr. Sadeghi will share his insights on implant placement and surgery utilizing CBCT. *Pre-register FREE today. First 50 pre-registrants will receive a 10% discount on tuition fee when official registration opens on May 13th, 2013. Relax, Unwind and Give Back with ClearDent in Toronto! As a thank you to our clients and to the dental community, ClearDent is delighted to host our annual ODA Annual Spring Meeting party on May 2nd @ 5:30pm at Joe Badali’s. Please join us for drinks, hors d'oeuvres, and some fun! Register online at cleardent.com/oda or call today toll free at 1-866-253-2748 Ext. 6. (12 pm - 8 pm EST). Space is limited, be sure to RSVP by April 25th! If you can't make it to our party, please come by booth #1139 and experience ClearDent: the #1 choice of dental software for today's successful dental professional.